I’m closing the doors to new partners on December 21 (until early next year). That’s almost unheard of in the marketing world, but it’s a decision you should consider, too. A lot of digital marketers are really good at selling their product or service. But the more they sell and the faster they scale, the harder it becomes to *successfully* DELIVER to clients + customers. I believe you should NEVER risk the quality of service you provide, for anything (including more money). And that’s what this episode is all about. I’m sharing the details behind the decision to close our doors for the remainder of 2018 (when we typically sign up to five people in a week!). As a reminder to future partners: We’re closing the doors to new applications on December 21, 2018. Tune in to this episode to hear our behind-the-scenes decision for WHY. [5:44] We’re closing our doors for 2018 – here’s why. Hey, everyone, and welcome to the podcast. 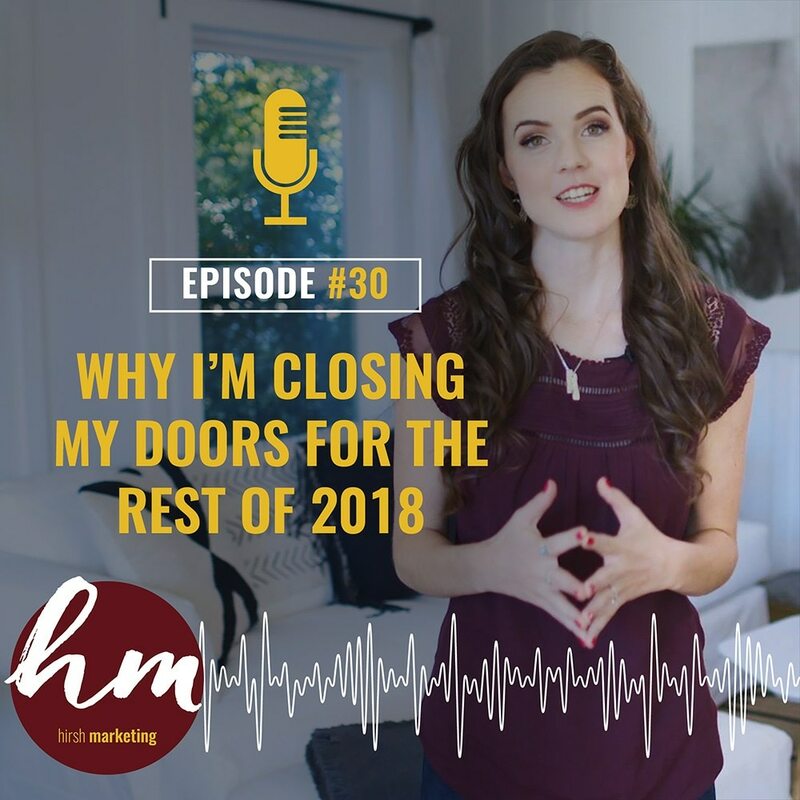 Today I am sharing with you guys why I’ve actually made the decision to close our doors completely for taking on new clients, effective December 21st, until the beginning of next year. And if you didn’t listen to my podcast episode that came out a couple of days ago about why we are no longer an agency, definitely go listen to that one, because that will fill you in on some various things. Today I’m talking about why I made this decision to literally close our doors, shut down the doors. We are not letting any other clients in, regardless if they are like, “Here, I’ll pay you $10000.” Whatever they say, our doors are closed until early 2019, effective December 21st. We only have a couple more spots for clients to come in. Here is the secret sauce of why I’ve been able to serve over 65 clients. Now, at the beginning of the year, we were probably at 35, 40, but also the level of our clients has gone up, like the level of accounts we take on, from the beginning of the year. The reason I’ve been able to serve that many clients and scale is because of the amount of effort and time and money and resources I consistently put in to our delivery as an agency. I’m saying this. I want to talk about this today, not to brag. Not to brag, because my team is amazing. My team is freaking powerful, amazing. Our systems are out of this world. We have systems on top of systems, and processes, and it’s so needed for any service based business, I believe. Especially in marketing, where you have a ton going on in each account, especially the way we do it, because it’s not just Facebook Ads. We’ve got tracking in funnels, and the creative, and the results, and constantly adding to it so that no balls get dropped. We’re able to scale. We’re able to give the clients the attention, and our Hirsh partners, the attention that they need and deserve, even as we grow like to keep it feeling small scale. Every business, here is something that I see over and over again. Businesses are … a lot of us, especially in the digital marketing space are amazing at selling. We’re really great at selling. We can sell, we can get new clients, and we can sell whether it’s courses or your service or whatever. And then that takes up so much of our effort and so much of our resources that the actual delivery of the product or the service gets really, really dropped. But let me also tell you that I can say every single client and partner on our roster who puts time and effort and really puts boundaries around the delivery in their business makes more money. Because at the end of the day, a product or a service that’s bad, it can sell for a little while. Good marketing, it can sell for a little while, but that’s not sustainable. And so it’s so important that even if it means saying no to opportunities and turning down money, you and ever risk saying yes, when that’s actually going to risk the quality that you’re delivering to your clients and your customers. I have talked to so many agency owners and people out there, and remember, we’re not an agency anymore. We are our own category of a marketing management company. But so many people in this space who lack the delivery skills. And it’s sad. It’s sad to me because it’s really good marketers and people who can run ads. They can run ads, they know marketing strategy, and I would say if they had a couple of clients, they’d kill it. But the second they start scaling, they are just blowing up their business, and they are losing their reputation, and it can happen so fast. And I know, I know a lot behind the scenes because I have a lot of clients who have come to me after working with certain people out there who this has happened to them. And whenever I hear it, I know the inside of what it’s like, but to a client who left someone’s roster and their ads weren’t watched, not enough audiences were tested. Their results were very little and hard to scale and hard to make money. Or they didn’t have a lot of creative tested, or their account way overspent, or the reporting was wrong and they felt like they are being lied to. They just look at it, obviously, as that business isn’t capable, but when that happens, when someone comes to me and they had that experience, I know first hand that it’s because that business doesn’t have enough systems to be able to watch the accounts that they need. That is part of my secret weapon, is the systems. Not only do I have the systems to do it, but I also have team members who are helping me create those systems so it’s not just all me now. I mean, I have amazing operations people on my team, but we prioritize this. And that is why we are closing our doors December 21st until early 2019. Completely shutting it down, will not be signing on new clients during this time, which normally we sign about three to five a week, won’t be signing any on because we are doing an overhaul to our delivery. Everybody who got in before then and the couple more than will get in before then, not only are going to get a price deal, because we’re raising all our prices January 1st, but they also will get all of these updates that we’re doing for our clients. I have the biggest marketing company serving influencers by far. Why? Because I put time and effort consistently into delivery. We never have a perfect business. We’re always improving something. We’re always looking at where something happened with a client account or a team member or a system. Where do we improve? And we’re not getting in over our head as we grow, and which is why we’ve made this decision before to close the doors and have two to three week waiting periods. Now, we’re officially. You can’t even sign on. You can’t get a call because we’re working on overhauling these things, and then we’ll slowly take on more people for the capacity that we can. 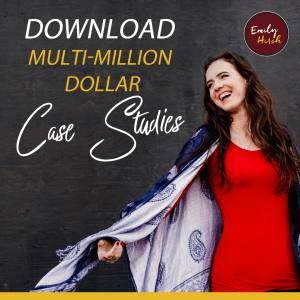 I wanted to do this episode specifically because I want people to understand that while I know marketing and lead generation and getting the sales is important, but at the same time, as you start growing, and as it starts taking off, and you start pouring fire on that, or gasoline on that fire that you’ve already created, care about your delivery. And don’t get in over your head, because if you do that it’s super detrimental, especially in the service business because you’re talking about your reputation, and for me, my reputation is everything. I never want to be in over my head with my team overwhelmed to where we can’t deliver, so that’s why we make these decisions. I also see a lot behind the scenes, and I can tell you of these huge accounts and these huge clients who have multiple seven figure launches. They put a lot of effort into the delivery. And remember why we all started this. We all started this to change people’s lives, right? And make a difference and impact these clients and get them results or change their lives, or make this … whatever your goal is with your product or your service. You started it for that reason. Don’t lose sight of that in the marketing. Don’t lose sight of that and not be able to hold yourself to that promise, not because you can’t do it and you don’t have the capability to do it, but because you got in over your head. And it might sound obvious, but I can just … it happens way too often, and I’ve seen it happen with also very successful people where they then put something out there that they shouldn’t have yet because they didn’t put enough into the delivery. And it’s damaging for them. It’s damaging. So, this is the official announcement of we are December 21st closing our doors until early 2019. We have literally two spots. We have two spots left for clients, and as soon as those are filled, on December 21st, we will be closing the doors until early 2019. And then we only have a few spots in January, too. We’re going to be slowly letting people back in. And if you haven’t gone back on and listen to why are no longer an agency, definitely listen to that because I’m creating a movement here, guys. You’re part of the movement by listening to the podcast. And, 2019 is going to be huge for Hirsh Marketing. We are stepping out of the box of being used to be called an agency and considering ourselves an agency and creating our own category in the way that we deliver and the way that we partner with our clients, and it’s going to be huge. It’s going to be huge and I’m super excited. If you’re already in and you’re already one of our … we’re calling our clients partners now; Hirsh partners. If you’re already one of those Hirsh partners and we are already helping you with that, with your marketing and skyrocketing your business you’re in, congratulations. If you want to be in, there’s literally a couple spots, so go to helpmystrategy.com and you apply. We’re also very picky about who we choose because we want to be able to get you results. Like I said, partners, and that’s who we look for, so that is that. And if you guys also need to do the same for your business. Look at your delivery. Can you take on the workload? Usually January and February are great months for a lot of businesses, so make sure you’re ready. You’re ready for those sales and those businesses. Take a step back, if you need to this month and look at that, because you’ll be really happy that you did. Thanks so much for listening, guys. 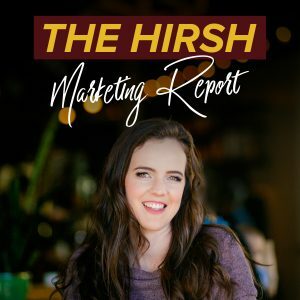 I’m so grateful that you’re a part of this, and I mean it when I say, Hirsh Marketing is leading a movement right now in the online marketing space and the delivery of marketing services.